A CRM program is used to manage your relationship with your customers. There are many CRM programs available these days, with a wide variation in pricing and capabilities. 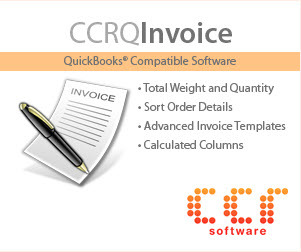 As I’m interested in QuickBooks, I’ve been looking at CRM programs that integrate with QuickBooks. Today I’m taking a quick look at Legrand CRM Pro. I will be focusing mostly on how it integrates with QuickBooks. In my business I use Microsoft Outlook to manage email and QuickBooks to manage my accounting. Neither of these programs provides a “complete” package by themselves. QuickBooks can’t track my conversations with my customers easily. Outlook doesn’t track accounting information, nor does it provide great capabilities for managing the process that I go through to develop and support my customers. I end up with three totally separate databases that are hard to work with and keep in sync – my Outlook database for email history and customer contact information, my QuickBooks database for customer records and accounting information, and a separate database that I use to track information that doesn’t fit well in either place. A way to either consolidate my contact/customer records into one place, or at least keep them in sync. A way to manage the contact-lead-sales-support process for my customers. Integration between the contact information and the sales information. I want it all to work seamlessly and smoothly without a lot of fuss and bother. One thing that I learned quickly, when talking to other QuickBooks users as well as vendors who provide CRM programs – everyone has a different idea as to how information should flow, what features are important, and what steps you should take to make this all work. What I’m presenting here is my own viewpoint, what works for me might not work for you. I won’t go into detail on this, just give you my overall impression. Basic installation of Legrand CRM was fairly easy. However, setting up integration with QuickBooks took more work. There is an installation summary document, but it didn’t cover the accounting integration. There is a separate application noteon their web site about QuickBooks integration is available, but you might not notice it at first. I was able to get the integration to work without those notes, but there were a lot of places where I had to stumble about and retry things. You definitely want to read through the separate QuickBooks integration notes. Legrand CRM manages a database that has both Companies and Contacts. Outlook (by itself, without addons) has Contacts. QuickBooks has Companies. Getting all of these to synchronize isn’t a simple chore, but Legrand CRM does a pretty good job. Each database wants to store information in a different format, keeping them all in sync is complicated. 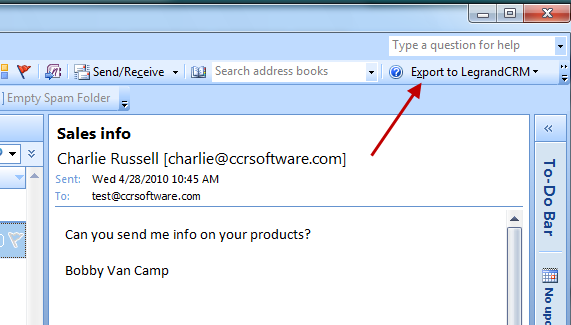 In Outlook you will see an Export to Legrand CRM menu in your toolbar. 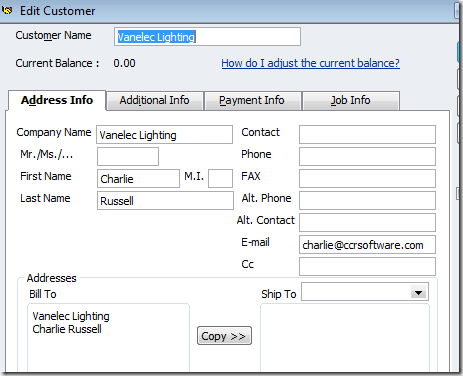 This provides a number of options to link an email message to Legrand CRM. When I look at an email message I have to click one of the “assign” options to get this into the CRM database. If this is a new contact, Legrand will let you know that you need to either set up a new record (both company and contact, possibly) or find an existing record to connect it to. This process worked quite well, although it did take a few steps to set up all the necessary information. Legrand CRM does a good job at trying to determine what information should go where in the contact screen. The next time you get an email from this address, the assign function will locate the established record. 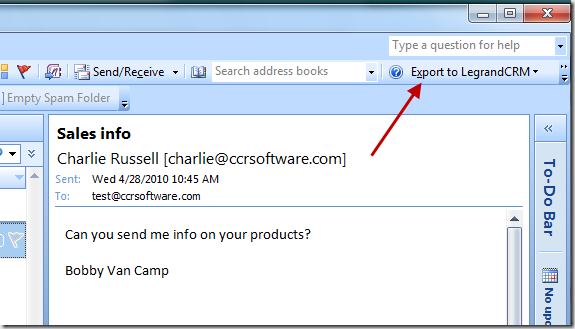 Attachments to email messages can be brought in to the CRM package as well. I had a long discussion (argument?) with the founder of the company, Alain Legrand, several years ago at a QuickBooks Enterprise user conference about this process. My preference would be to have Outlook automatically save the messages to the CRM database once a link has been established. He insisted that this would bloat the database, so he opted to require the user to have to explicitly tell the system which messages to save. I’m not convinced, but the process does work the way they want it to. 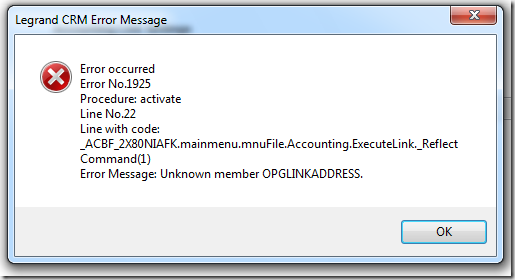 So, now I have established a link between Outlook and Legrand CRM. 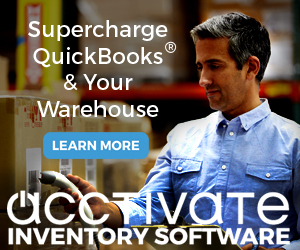 What about QuickBooks? 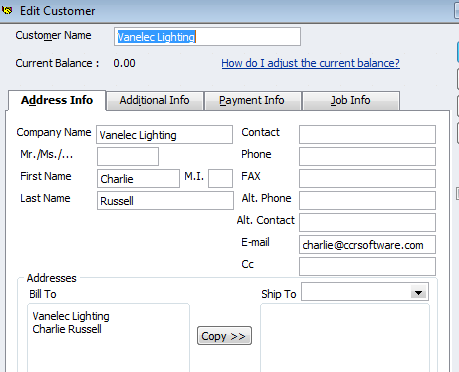 If I have a company record in Legrand CRM, the Accounting Menu provides a number of options to push this information into QuickBooks very easily. In my work flow I like having the ability to “push” the data from the CRM into QuickBooks when I need to – I don’t need every contact in my accounting database. Here is the record as you see it in QuickBooks. Please note that I didn’t fill out all of the fields in the Legrand CRM record, so this may look a bit sparse. So what we have this far is the ability to start with an Outlook email message, create a contact record in Legrand CRM, and then eventually move that into QuickBooks, without having to retype all of the information. Let’s take a look at the Company Detailwindow in Legrand CRM, where I’ll point out just a few of the features I feel are important (and I’m skipping over a LOT of information here). Contacts – you can have multiple contacts for a given company. The company window shown here contains an aggregate of the information from the individual contacts, which I find very useful. Accounting– This provides you with a very good summary of information about the company, based on information imported from QuickBooks. Documents – This is very interesting and I haven’t explored it. I’ve reviewed a number of Document Management programs, such as SmartVault, and I know that there is a lot of interest in this. Legrand CRM has the ability to import documents and save them with your company and contact information. This is a different approach than the other DMS products, where the document is attached to a specific transaction or record, but you may find it a very useful alternative. Transactions– I’ll discuss this a bit later, but you have the option of synchronizing information with your accounting info in QuickBooks. Invoices can be listed, for example. If you double click on the invoice you are taken into QuickBooks to view the transaction (if you have set it up to work this way). Activity Notes– you will find your email messages (and other items) here. Normally Legrand CRM will store a text summary of the email, but you have other options. 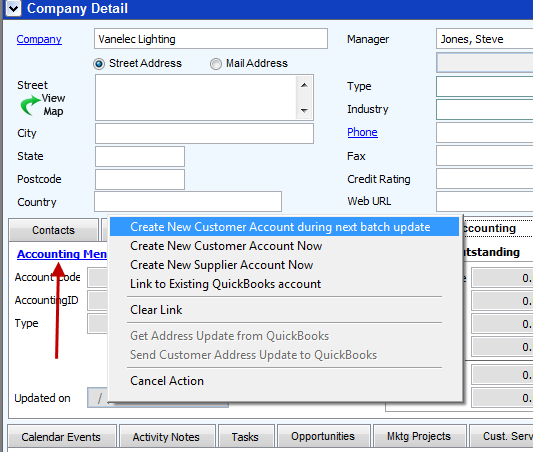 Double click on a listing to open the message in Legrand CRM. Calendar Events – you can synchronize your calendar with the Outlook calendar. 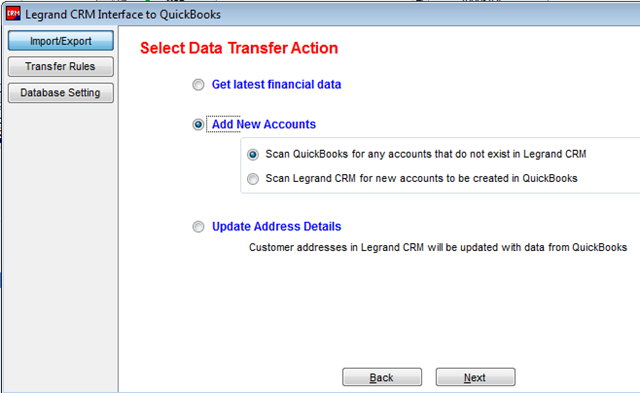 As you update data in your various databases you want to find a way to keep the information in Legrand CRM up to date. This is a very complicated process when you are working with data from a variety of sources from different companies. Legrand CRM does a reasonable job here, but I was hoping for something a bit different. 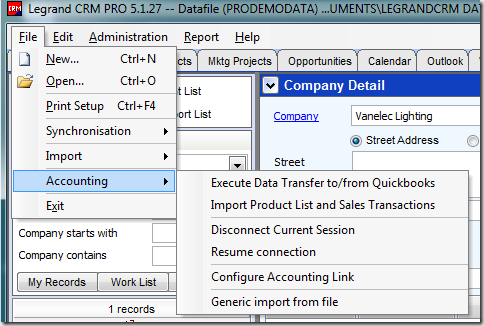 In the Accountingmenu you have a function to initiate a “Data Transfer”. It won’t happen automatically. An automatic sync is tricky, because you don’t want it to affect performance of your programs as you are using them for other things. QuickBooks doesn’t make synchronizing simple (even their own products have problems sometimes). You have three options. Get latest financial datawill sync the information like invoices and payments. It is important that you realize that the information you see in Legrand CRM is only as up to date as the last time you ran this option. 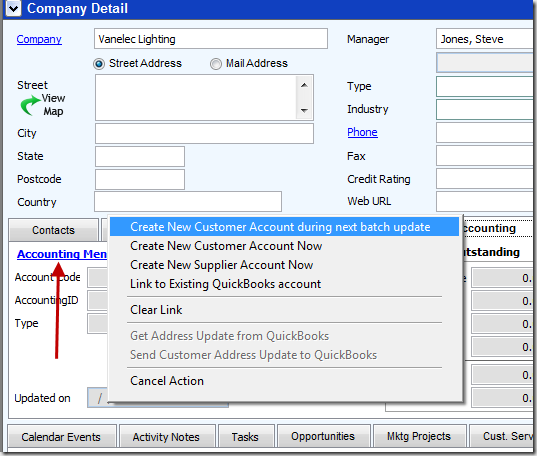 Add New Accountslets you move information either from QuickBooks into Legrand CRM, or the opposite. I’m still debating this – is it better to do this, or would it be better to have a two-way sync? At this time I’m considering just moving new contacts from QuickBooks into Legrand, as I don’t want to fill up QuickBooks with contacts that aren’t paying customers. Update Address Detailsis a bit annoying. 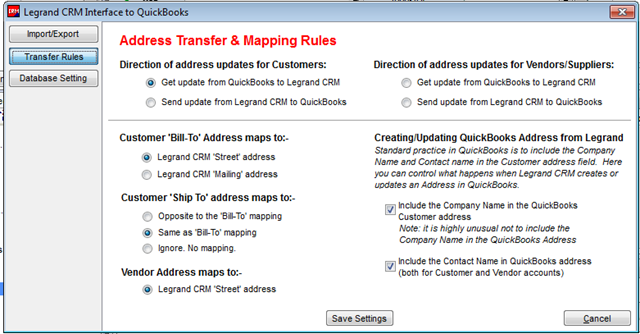 It only will sync changes in addresses in QuickBooks into the Legrand CRM data. 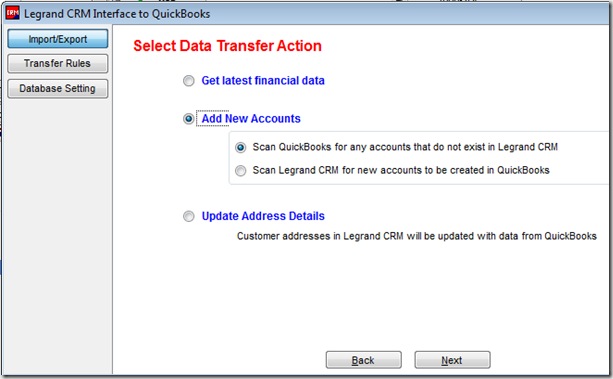 There isn’t an option to move updated info from Legrand CRM into QuickBooks. I mentioned before that synchronization was a complex task, given that each program organizes the data in different ways. Legrand CRM does give you a number of options to control how this works. Let me start this section off my making some disclaimers. Any CRM program is a very complicated application that takes time to set up and understand. My review here was written after a very short attempt at using the program. Integration with QuickBooks is not an easy thing to do. Intuit doesn’t provide the best programming interface, and their database has a number of very odd twists. Any program that can get data in and out of QuickBooks reliably is doing a great job, even if I tend to gripe about details. The instructions on where to find the option to re-set the information was not correct. When I did the reset, the error continued to display. The fix was somewhat simple – close Legrand CRM, close QuickBooks, restart. The error went away, but it was a bit frustrating. This was a bit frustrating – what is record “40000-1149028036”? I don’t have a way of knowing what this is. 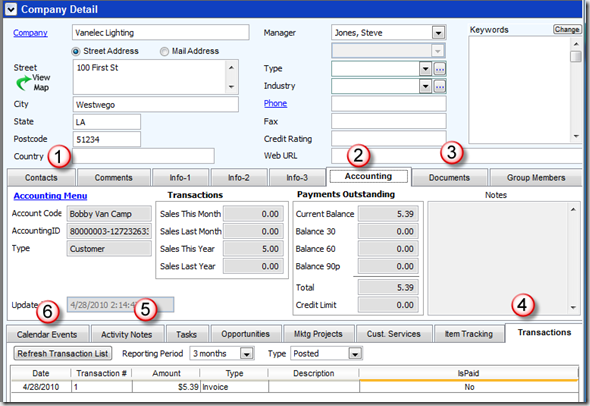 QuickBooks assigns an internal key value to all items and transactions, which you can’t see in the QuickBooks user interface. It is hidden from us. Third party addons can see this number, and Legrand CRM is displaying it, but there isn’t anything in this error message that tells me what the problem is, what data it affects, and what to do about it. In my initial transfer I received a large number of these errors, one at a time, rather than in a list at the end of the transfer. So I had to sit there and click “OK” over and over. Poor design of this particular feature. 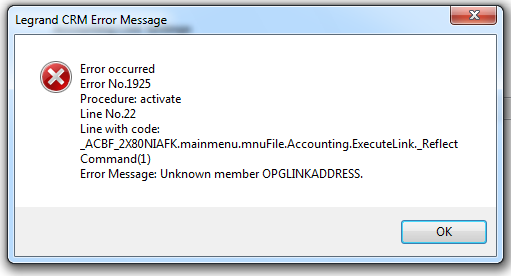 Again, I have absolutely no idea what to do about this, how to resolve it, what it affects in the program. 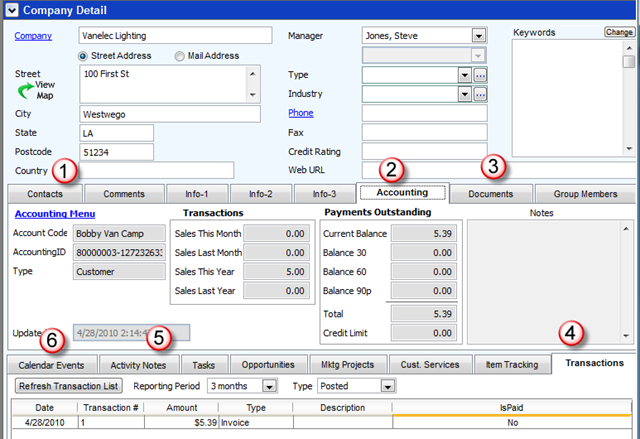 Legrand CRM integrates well with Outlook, reasonably well with QuickBooks, provides excellent CRM features, runs reliably (other than issues I had with QB integration in some cases), is a company that seems to be stable and has been in this market for quite awhile. I have only touched the surface of what this program can do for your business. CRM is so much more than just integration with Outlook and QuickBooks, and your decision on a CRM package should be based on many factors that I don’t discuss here. I’m considering using Legrand CRM as the CRM program for my company. If I do, and I find out more interesting things about it, I’ll write a note here. Legrand CRMis available in two versions – a Pro version (using FoxBase as the database) and the Corp version (using Microsoft SQL Server), intended for larger companies. The product is priced in both a “subscription” mode and an outright purchase. This isn’t cheap software, and be aware that there is a minimum number of users that you have to license (which seems to be a very typical situation with CRM products). My thanks to Bonnie Nagayama of McWilliams Associates Incfor her help with acquiring this demo. Bonnie is a well respected member of the Intuit ProAdvisor community who uses Legrand CRM in her business, and she recommends it highly. She is a source for the Legrand product as well as support for installation and training if you need it (for a fee, of course!). Great article! I’ve used LeGrand as a standalone CRM application previously (mainly for newsletters and contacts) and really liked it. We did the R6 update and just like with previous updates now there are old Liability items showing that are past due. When you look at the check regiser and the general ledger they were paid properly and on time, but they are in the “Pay Scheduled Liabilities” section. Why does this continue to happen? Margaret, that is a bit off-topic for this discussion thread. We are talking about the R6 update in other discussions. However, I have to say that I’ve not run into that problem with the R6 update. It sounds like you may have some damage in your company file if this is a recurring problem. 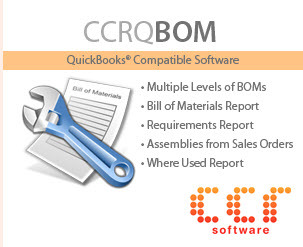 Did you end up using Legrand or evaluating other CRM’s with Quickbooks? Carol, I’m embarrassed to say that I’m not yet using a CRM product other that Business Contact Manager in Outlook. Very poor. I have a copy of a product that will link ACT with QuickBooks that I will try (I didn’t like the “link” product that Sage was selling for ACT to QuickBooks). I hope to try that later this year. I had tried to do a review of Results CRM, which is well thought of by some people. At the time I tried to install it, I could not get it to work on my Windows 7 system. I was just talking to them the other day and they inform me that it is updated to resolve that problem, so I’ll try that again. Sounds interesting. Should I include this on our CRM comparison website? Cliff, I almost removed your comment, as people who post comments like yours are usually just angling to get a link for SEO and don’t have much to offer. In your case, at least it isn’t too much of a spam (there is a real blog there, it appears). However, I do have to say, you are missing a LOT of CRM products. All kinds of products out there, that work with QuickBooks, that you don’t list. So if someone is looking for info on CRM for QuickBooks, your web site doesn’t offer any real help. 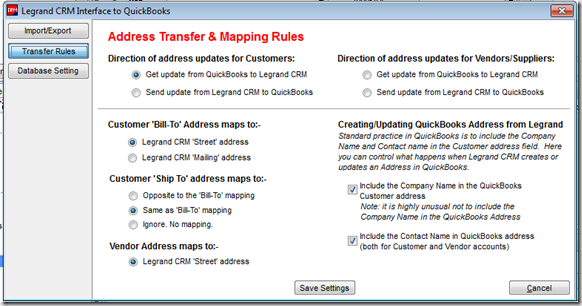 « QuickBooks 2010 R6 Update – 64 Bit QuickBooks PDF Fix and More!